After a break for Thanksgiving weekend, I chose to race maybe my last time this season in Wrightsville, Pennsylvania at the Rivertown Cross Race. I’ve liked this course over the past years and have always raced very well here. I think it is more about where the race comes in the season than it is about the actual event. My health and fitness generally improves during the season so by the time this race comes along in early December each year I am hitting my peak. This year was no different, I was strong and rested. There was very good competition at the event with Kevin Justice, Bob Reuther, Eric Schlauch, Kelly Cline, Mike Stevens, Marty Mrugal and Werner Freyman all in attendance. Off the start I slotted in behind a strong Kevin Justice and stuck to his wheel as he churned around the course. After a lap or so it was down to me and the strong men mentioned but soon we started shedding riders so that by the second lap it was a five strong group of Kevin, Eric, Kelly, myself and Bob with all the others out of the mix. Our group fought on holding that order but with nobody able to gain an advantage. Sitting 4th wheel I watched the others ahead of me and decided I needed to attack this group to make an attempt to break away (or at least disrupt the group and change the dynamics). About halfway through the race I picked my spot and jumped past Kelly and then Eric and Kevin and continued to mash the pedals. Kevin and Eric clawed back up to me but Kelly and Bob were split off. In the penultimate lap Kevin attacked forcing Eric and I to respond. Kevin was very strong but we got back on terms with him and were together into the final lap. Kevin kept a furious pace and first I fell back then Eric dropped away. We fought on all just a few seconds apart and completed the race in that order. I gained a podium but more critically, I stayed with Kevin and Eric through the race which is not easy to do. Kevin has been riding away from everyone the last half of the season winning by huge margins over the second placed rider. Eric is a talented rider that I rarely challenge deep into races. So, to race wheel to wheel with these two and to attack them deep into the race is a big result for me. Again this year, Rivertown was terrific race for me. Sunday November 19th, Phelps School Malvern, Pennsylvania: The Pennsylvania State Championships. On November 11th I lined up for a race in Pottstown at the Sly Fox brewery and restaurant. This race always has a fun energy to it with lots of fans, large fields of competitors and a challenging race course. This year the course had some very technical sections including a challenging off camber descent on frozen ground. In races prior to mine many riders chose to dismount and (attempt) to run down it. Even that was difficult as many simply slipped and fell. I heard that there were a good number of people who saw this section and simply decided to not even start their race. In pre-ride I worked this section through multiple times and was able to ride it cleanly. The trick was simply to commit to it and let it roll, no brakes. Are you getting a hint as to what happened? In the race I started off well and was with the leaders, but on this day I was not at my best for whatever reason and could not stay with the leading trio of Kelly Cline, Kevin Justice and Bob Reuther. I was able to ride cleanly and with some power and so was able to battle for 4th place with several riders including Mike Stevens. I was particularly good in a difficult ascent and able to ride it most of the time where others had to dismount and run. This kept me in the battle. I also rode the tricky descent cleanly along with the other features. I was doing well. In fact Mike and I dropped our other competitors and closed in on Kelly (but never made the catch) due to my riding cleanly. In the final lap, calamity struck. Mike and I were still battling back and forth when in the last half lap I crashed HARD. Ahh, but NOT where you think! I crashed in a simple part of the course. As I charged forward my handlebars caught a course stake and I was violently thrown down hard onto my right side. I felt my ribs pop and had the “wind knocked out of me”. I was quickly back up and on the bike as Mike gained 50 meters on me, but I knew I was hurt. Still, I rode the tricky descent cleanly and the other features and was able to just catch up to Mike at the finish line, but he held onto 4th. After the race, my right rib cage hurt a lot. It was painful to move in certain ways. My shoulder and hip were sore as well, but that was nothing compared to the ribs. There was acute tenderness in the ribs and popping/clicking feel when I moved it certain ways. Not cool! I went home and did the acute care of frequent ice to the area and ibuprofen for inflammation. I used Kinesio Tape to protect the ribs and stabilize the problem level. This actually worked wonders as the next day I could ride my bike without pain, although I could not bear any pressure to the right ribs. This is where I didn’t follow good advice: I lined up to race again on Sunday November 12th at the Victory Brewery in Parkesburg, PA. I pre-rode the course and saw that it was NOT a technical course and I felt okay so I determined it would be safe to race. I just decided to give it my best and have fun. Off the start I jumped into the lead for the first couple minutes until Kevin Justice came by and I followed him for the next several minutes. The two of us had a small gap on the remainder of the racers but Kevin was simply too strong for me and he rode away. A group caught up to me and I proceeded to lead the chase of Kevin for a couple more laps. I preferred to lead as it let me set my pace and pick my lines, but I was implored by fans watching the race to stop doing all the work and make someone else take over the lead. Mike Stevens and Marty Mrugal made an effort to pass me, so I listened to the advice and let them take over. This worked against me as Marty set a blistering tempo and had me (and apparently the others) in difficulty. On top of this, a couple guys in our group made some errors which slowed me down and left me chasing to catch back up to Marty, Mike and now Bob Reuther. Unfortunately for Marty (but fortunate for me) he got a flat tire that slowed him down and sent him to the pit zone for his backup bike. This allowed me to regain contact but now Mike and Bob went on the attack leaving me struggling. I fought back but could not hold them. They rode in for second and third place with me a handful of seconds back in 4th. Overall it was a good weekend of racing, but a bad weekend for my health and fitness. I was happy I could even race at all on Sunday considering my rib problem. My concern was that in one week was the Pennsylvania State Championship race which I was targeting. My number one focus was to recover and heal up. I determined that I could not do my strength training session, or my core strengthening work and I had to be careful on the bike. So that was the coming week’s plan: Mostly recovery riding, one session of intervals, and only one race the next weekend: PA States. Sometimes you just KNOW it is going to be a good day. It has been a very different approach I’ve taken to racing this year; from the late start, to racing only once a weekend, and to relishing riding from the back and working my way forward. It HAS been fun and I have been able to race very well even without ever getting to the front of a race. BUT, that no longer felt like it was enough. My strength and fitness have grown and I have seen that I can be and should be with the leaders. This weekend, that was the goal: To race with the leaders. Saturday November 4th was Swashbuckler Race at the Pennsylvania Renaissance Faire; a race that I have always enjoyed and that has a good mix of challenges. I FINALLY had a front row start and blasted off from the gun straight into the leaders position where I remained for the first lap and a half (goal achieved!) until I slid out in a corner. From that point I chased back onto the lead group but was soon dispatched by Kevin Justice, Robert Reuther and Kelly Cline and left battling with Mike Stevens and Marty Mrugal. The three of us fought hard until I dropped them and went after Kelly. I closed to within about 8 seconds of Kelly but could not quite get there. I finished a strong 4th, one step away from the podium boxes. I had not raced both days of a weekend this season as I just didn’t want to. But this weekend was different: I WANTED to race again. So on Sunday November 5th I went to Stoudt’s Race. This course is always challenging with plenty of climbing, several technical sections and a challenging (to me) wooded “mountain bike” section that always seems to be muddy and slippery. There were more racers and a deeper pool of competition at the event so it would be interesting. I snuck into a front row position today and at the gun went off fast settling in behind Kelly Cline as we made the first climb. Through the opening minutes I rode with the leaders but soon Kevin Justice attacked off the front and rode away. Kelly and Robert Reuther pursued him leaving me and the others to chase. As the second lap began, Robert flatted a tire and lost pace with Mike Stevens, Ben Anemone and myself chasing after Kelly and Kevin (who continued to motor away). As the race strung out Mike and I battled back and forth with Kelly up ahead and Marty Mrugal trying to catch us from behind. Eventually I dropped Mike and I went after Kelly alone and on this day I made the catch. Kelly and I would battle back and forth for the final lap and a half as neither could drop the other. Kelly got around me in the closing minute and opened up his sprint first and with the finish straight too short I just couldn’t get around him. He outfoxed me taking 2nd place but my 3rd place put me ON the podium boxes for the first time this year. This season has gone very well. I’ve had fun, been able to push my limits and even learned a little bit more about how to race. It is rewarding to see my progress and feel I have EARNED my place back at the front of the race. I reached this weekend’s goal of racing at the front and due to my hard work, I also found the podium. Today I went to West Chester to race. Can’t get much better than this event; it is close to home, it is a terrific and challenging course, it is run by a dedicated and good crew. Bob Reuther, Scott Gamble and the Bike Line Team organize the event and donate proceeds to the school district’s wrestling team. Along the way they make sure the event is fun. At the race today I realized how lucky I am to know and be supported by such a good group of people. At some point or another, these people are there to help you, to lift you up, to laugh with you and to care. They don’t ask for something in return. Cyclists just treat you like one of the family. If you are not a cyclist I know that through the window of your car cyclists can appear annoying, dangerous or careless. And there are some who certainly are those things. The majority of them are not. They will stop to help you if your car breaks down. They will see if you are okay if you are in an accident. They help lost dogs get to safety (Laura Van Gilder is famous for this). They keep an eye out for problems in the neighborhood. I’ve seen cyclists move things like trash cans or other debris from a roadway so cars can pass more easily. They are generally good people. Cyclists want to be and feel safe on the roadways and generally try to ride in such a way to achieve that. They recognize a car is bigger and faster and thus a cyclist rides to protect themselves. This can appear rude (and sometimes it is). But you can be sure that the cyclist is a mother or father, son or daughter, a friend. They may have a spouse. They probably have a pet at home waiting for them. They ride for transportation, to get to work, to relax after work, or to be fit and healthy. In sum, cyclists are people just like you, or your child or your parent. From the perspective of our car it is important to remember that the other users of our roads are people just like us. Let’s treat them how we would like to be treated or how we would like members of our family to be treated. In my racing I am still working forward with my fitness and I need points for better start positions. At West Chester Cross Race I started 3rd row but was able to jump right up to the leaders where I stayed for just a short while until 4 got away. For the second week in a row I was driving the second group with a load of guys pushing me hard. We battled back and forth slowly dropping guys from our group. I was leading Mike Stevens and Chris Chapman and feeling in control when suddenly I wasn’t. Taking a fast downhill right I slid out and across the course allowing Mike and Chris to attack past. The two teammates worked together and although I tried, I was not able to regain contact. I finished 7th. Feels like it shoulda, coulda been better. Afterward, Mike and Chris checked on me, congratulated me on a strong race. Cyclists are good people. In my first attempt at racing last weekend I had fun and was happy to catch up to a bunch of guys I hadn’t seen since last season so I figured I’d keep it going. I traveled down to Baltimore today to race Charm City Cross in Druid Hill Park. It was a hot and humid day, the course was challenging (one of the best courses I’ve ever raced) and the competition was very strong. After my first race I realized I could push harder but I still wasn’t quite sure where my level was. My goal was to ride hard and dig deeper, but I knew I was not quite good enough to push the leaders. Best bet would be to tack onto the back of the lead group and follow as long as I could. I shot off at the gun and was able to jump onto the back of the lead group (just as I’d hoped) and stay there through the majority of the opening lap. As we started lap 2, I was in 6th place, with the 5 guys in front several seconds ahead but moving away. I had a gang of racers breathing down my neck when I instituted the second part of my plan – ride hard and dig deep. I pushed the pace but still several riders attacked around me. I kept at it and battled back and forth with several of these guys, and along the way we distanced most of the others chasing us. One guy got away from us and moved up into the lead pack (wish I had the fitness to make that move!) leaving me fighting for 7th place. As we were in the final lap it was down to me and one other guy when I noticed my pedal was loosening. Luckily I was approaching the pit so I was able to go through and switch to my spare bike and jump right back out onto the rider I was battling. I immediately attacked him and he chased me hard to the finish straight where I opened up my sprint and surprise of surprises, our efforts had brought us up to one of the leaders who I ended up outsprinting to take 6th place! It was a great race. I pushed “REAL deep” and had a very strong result against such tough competition. It was a fun day where I learned a lot more about my fitness. I also had time to hang out with some guys and enjoy watching the professionals take on the same course. It was a terrific day. I guess I’ll do some more. Today I answered some of the questions that were being asked: Are you racing this year? What’s going on? Where have you been? On Thursday I made the decision to race this weekend. For whatever reason, I finally started to feel like racing again so I mounted up a set of cyclocross wheels and took my bike to a nearby park and practiced a few cyclocross techniques. Everything went well, I felt good so I signed up for a race in Lambertville, NJ (Hippo Cross) that I’d never done before. The event sounded fun so I figured let’s give it a roll and see how my body holds up. The course was around a farm and had good features for my first event of the season (punchy hills, long straight drags without anything highly technical). Since I haven’t raced I was given a back row start position but I immediately jumped from the start and hooked onto the lead group where I hung on for the first lap before unhitching and riding mostly against myself for the remainder of the race. This was essentially what I anticipated as I had to “shake out the cobwebs” and get used to the intensity of racing and find out where I was in terms of fitness. In the end, I was 11th. It was a good showing for me though; my lap times were very consistent throughout and I made no mistakes or blunders while cornering, shifting or bike handling. Most importantly, I had fun and caught up with a bunch of old racing friends. It turns out I missed racing more than I thought. Will I race this season or not? What am I up to? What’s going on? Questions I’ve been hearing for the past several months. People searching for answers...including me. It’s been an unusual spring and summer for me on many levels. Yes, I am healthy; Yes, everything is okay. I’ve just been busy in my personal life and my career which has made me question whether I should or want to compete in bike racing. I’ve stayed fit and healthy throughout the off season. Done strength training and really enjoy how strong I feel. Done riding, and have been surprised and perplexed that I have better endurance than I can EVER remember having. I have thoroughly enjoyed riding my bike on long rides. In fact this Summer I fulfilled a goal I’ve thought about for many years: I rode from my home in Delaware County up to the Poconos. It was a 130 mile trip, and I completely loved the entire ride. I was astounded that I felt terrific climbing the last major climb after 110 miles and finished the ride knowing that I could keep going. Along with this, I just haven’t felt the desire or hunger to race. It was strange as I’m usually raring to go by July or August. So instead, I’ve just allowed myself to enjoy riding. I’ve gone out and tried different things on the bike. One day I saw how long I could ride using only the biggest gears. Another time I wanted to see if I could climb 6000 feet (I did it plus another 1300 feet for good measure). How many dirt roads could I find to ride? How about checking out other roads I’ve never been on. Let me see how it feels to ride a particular hill using different gears or styles. Done all those things and had fun doing it. So will I race this season? Yes, I will…I think. I HAVE started to THINK about racing, but I haven’t started to miss it yet. My 2016 racing season thus far was one of “stops and starts”, “goods and bads”, “ups and downs’ or whatever such descriptor that comes to mind. In any case, “it is what it is”. My approach over the past several years has been to just take each week one at a time and focus only on the current race. It is an approach that works well. I can’t predict what my professional schedule will be like as things can change quickly. My family and personal schedule is even more unpredictable. Throw in the risk of injury, illness or overtraining and it made trying to plan out a season far in advance an exercise of frustration. I learned to train and prepare for the long haul, but to focus only on the next race. As my season came down to the final races, I was attempting to break out of the string of poor luck (flat tires, mechanical breakdowns) and showcase the strength and fitness I had built up in my training. Remaining in the season were 5 races including our State Championship race and the National Championships. Now was the perfect time to be reaching my peak. On November 20, 2016 the racing returned to West Chester for a Pennsylvania Series race. I was feeling strong and confident when we lined up on a cold and very windy morning. I was in the second row but jumped off the line very well. I then surged forward again and as we went through the early parts of the course I sat comfortably in 2nd place. I remained there for several more minutes until the leader, Kevin Justice, caught some of the course tape causing it to tear free and entangle my front wheel and front chain ring. I slowed and tore out as much as I could but in so doing, Bob Reuther passed by and accelerated away with Kevin. I exchanged my tape entangled bike at the pit and focused back on the race. At this point I was in a battle with several other riders while Kevin and Bob were off by themselves in the lead. I felt strong so time after time I attacked, accelerated and punched ahead. Slowly my group whittled down until only Greg Ferguson remained. He gave me a tough fight, attacking me several times in the final lap, but I in turn attacked him right back and in the final minutes I made one last powerful attack and dropped him allowing me to roll in alone for third place. I finally had the break through race I’d been searching for. Yes, I still had the unfortunate event with the tape that dropped me out of the lead group (and without which I felt like I would have been fighting it out with Kevin and Bob for the win) but I was able to race with power the entire way and get myself on the podium. FINALLY, I felt like I was racing as well as I had in the early season! After a break for Thanksgiving, I returned to racing at Pennsylvania Series event at Rivertown Cross in Wrightsville, PA. I liked this course in years past and was looking forward to this event. I got out to a strong start and half way through the opening lap I found myself in the lead. I pressed the pace to drop guys out of the group and relinquished the lead to Bob Reuther in the second lap. By the time we hit the third lap there were just four of us left in the lead when Kelly Cline mishandled a turn and abruptly stopped when his bike hit a stake. His bike blocked the course for Marty Mrugal and me and allowed Bob Reuther to get away. I tried to catch back up but Bob was gone and I was left battling Kelly and Marty. The three of us fought back and forth but none could gain much advantage until Kelly attacked with about a half mile to go. I stuck to his wheel and launched my sprint but hit the final turn too hot and slid my rear wheel around. I jumped again but Kelly held on by inches for second place. I was happy with the day as I had another good race where I was able to use my power and fitness and get a good result. Losing a sprint to Kelly is not an embarrassment as he is a smart racer and a fast sprinter. He got the better of me on this day and he earned it. The final weekend of local racing was in Emmaus, PA for Solstice Cross on December 10th and Limestone Cross on the 11th which also was the Pennsylvania State Championship race. I was in top form, my equipment was in good shape, and I seemed to have left my poor luck and mechanical mishaps behind. At Solstice cross the course was frozen with long icy patches, and lots of turns. This course had features that suited my abilities with strong power sections, but the frozen and slippery surface negated that advantage. Nonetheless we all had to deal with the same conditions so I was looking forward to a great race. Unfortunately I did not jump off the line fast enough and was around 15th place when we entered an early, slippery turn. A rider ahead botched the turn, stopping and causing the entire field behind to come to a rapid halt. This allowed about 10 guys to speed away and I saw my good result going with them. I got going and gave it a strong effort and WAS moving forward pretty well when about halfway through the race I flatted my rear tire and had to ride about a half lap to change bikes. I lost a ton of ground so I made the decision to just ride strong and steady and save a little for the Championship race the next day. I was looking forward to Limestone Cross and the Pennsylvania Championship race. I liked the course with its tough hills and long power straights. I wanted to make a run at defending my State Championship title. I was also feeling terrific. Then a terrible event occurred that changed the day and my entire mindset. An athlete was warming up for his race when something happened (I am not sure what happened and don’t want to create a false narrative) and he collapsed. Efforts were made to resuscitate him but he remained non-responsive when he was taken to the hospital where he later passed away. To say this was difficult to experience is clearly an understatement. All my thoughts and goals for the day were swept away as my focus and attention was on our fallen racer and hoping he would recover. When he was taken away in the ambulance, all I wanted to do was pack up and go home. On this day our cycling community lost a terrific person who we would all miss. After my successful early season races I was looking forward to this next block of racing. Because of my work and travel with Aspire Racing I knew I would be missing some training time, but I compounded that with additional travel for my worksite safety consulting thus effectively keeping me off my bike for nearly two weeks straight. I attempted to augment my fitness by focusing on strength training and running. All was going as planned until I over reached with an aggressive workout on a treadmill; I performed intervals of running with an incline of up to 12 degrees. The workout was challenging but felt useful as I pushed myself to fatigue. Unfortunately I did too much and injured my knee and had to deal with a painful, swollen knee that did not bend well and hurt to walk on. I followed the same plan and advice I give my patients: Ice, rest, kinesio tape for support and inflammation reduction, joint mobilizations and spinal adjustments to keep the remainder of my body balanced and stable. This led to improvement but forced me to skip an important race weekend in Baltimore in early October. The good news was I could ride and train on my bike without limitation or pain. The challenge was I could not run at all and climbing steps was uncomfortable. I returned to racing (maybe a little too soon) on October 15th and 16th at Cooper River Cross and West Chester Cross. In both races when I was on the bike I was strong and going well, but anytime I had to dismount I was slow on my feet. I raced well the first day at Cooper River and took 7th. I should have followed my own advice and NOT raced the next day in West Chester. They had a difficult uphill barrier followed by a run which caused pain in my knee each time I went up it. In the race I also flatted a tire and in conjunction with the uphill barrier I went backwards on the day finishing poorly. To top it off, my knee swelled again and limited my walking. This began a difficult string for me. My fitness was very good and getting stronger ON the bike. Off the bike I could not run to train at all, but the knee was improving. I was still slower than normal in any running sections but at least I could do them without pain or swelling. The difficulty was that in the ensuing 8 races from October 22 through November 13 I flatted 7 tires, had a mechanical issue with my handlebars two or three times as well as shifting problems at times. As a result of these difficulties through this time I had modest results, but was feeling strong on the bike. It was frustrating because I couldn’t translate the fitness I had into the results I wanted. I kept my focus and trained well which translated into some of the best fitness I have had in years. In measures of my power and fitness in training I was setting record numbers. I was healthy and my weight was exactly where I wanted it to be. I also tried to enjoy the racing and take little “victories” from each event by recognizing what I was doing well. At some point this would have to come together and I’d throw down a good result again! When I was brought onto the Aspire Racing Team to be their Team Chiropractor I had decisions to make about my own racing aspirations. I would not be able to race many of the events in the Pennsylvania or the Mid Atlantic series which would prevent me from placing in the overall standings. I would also not be able to race or train as much as in previous years. My season was going to be broken up by my trips with Aspire. I was okay with this as I was hungry to get back to working and traveling with a professional team like I had done in the past. My early season fitness and success was great, but now it was time to shift gears toward helping the Aspire athletes be successful. The first trip was to two of the most important cyclo-cross events in the US this year: The World Cup events in Las Vegas, NV and in Iowa City, IA. I’d never been to either event before but had read about them and watched their broadcasts in past years. In the weeks before, Jeremy Powers and Ellen Noble were both performing well and in good health. Then disaster struck in the form of a bad crash for Jeremy just a few days before the first event. The investment the team made to bring me onto the team was going to pay off straight away! I arrived in Las Vegas the day before the event and went to work immediately. With a combination of chiropractic techniques, myofascial therapy and kinesio taping I worked on Jeremy to reduce his pain and spasms, and improve his mobility. I worked with Ellen to help “fine tune” her for the racing. At Cross Vegas Ellen rode a stellar race coming in 8th place overall and was the first rider under 23 years of age thus taking the inaugural U23 leaders jersey in the World Cup series! Jeremy rode a gutsy and strong race to finish as top American and in 15th overall. It was not the result he had worked so hard for but frankly it was far above what he might have anticipated with the amount of pain and type of injury he had. I continued to work on Jeremy and Ellen over the few days between the races. With Ellen the focus was on recovery from Cross Vegas and restoration from the travel between the cities; she was healthy and strong so my work was all about helping her to be at her peak. With Jeremy it was more complicated. His injuries were significantly impacting his ability to ride, as well as his general overall comfort in normal activities. I continued my work to reduce inflammation, improve stability and improve function and he was seeing progress but the combination of the injuries, the travel and the Cross Vegas race was taking a toll on his general health. At the Jingle Cross race in Iowa City Ellen Noble road a fantastic race taking 5th place overall in this 2nd World Cup event and kept the leader’s jersey in the U23 ranking. The Jingle Cross course was very difficult with ample sections of thick mud, difficult power climbing sections and tricky off camber sections. A healthy Jeremy Powers would have had fun on this course. The injured and depleted Jeremy Powers had a rough time. He gutted it out and gave it what he had, but on this day anything less than 100% was not enough. For me, I was glad I was there to help and excited to be a part of one of the premier cyclo-cross teams in the United States. Seeing Ellen Noble blast onto the professional scene and take the leader’s jersey in the U23 category of the World Cup was unforgettable. I wish that I had a “magic wand” and could have done more to fix Jeremy’s injuries. The reality is that there is no such thing and that all I could do was to stabilize his injured body, help reduce inflammation and improve his function. Other than that, his damaged body needed time and rest to heal. My schedule was very full during the 2016 Cyclo-Cross season and I am using that as my excuse for not posting blogs as the season progressed. So as to not completely forget the season or to ignore the people who support my racing efforts by following my progress here, I will provide an overview of my season. The season began in late August with Adventure Cross in Aspers, PA. I really enjoy this event as the course is interesting, fun and challenging and is a terrific way to determine where my fitness is and how my equipment is working. I had a strong race and rode well on a hot and humid day finishing in 5th place. My conclusion from the day was that I was on target with my training and my equipment was in good shape. What I was missing was “race fitness”. In my definition, “race fitness” constitutes that ability to push yourself deeper than you thought you could. I think it is mostly a mental fitness where you get used to the sensation of digging out the deepest pocket of strength you have and use it all. You have to really BELIEVE you can dig a little deeper and get a little more and know that you won’t implode. For me, I get this more effectively through racing than through training. Two weeks later, on September 10, I raced Fairhill Cross in Maryland on what was the hottest day I have ever raced. It was in the upper 90s, in full sun and high humidity. We had a tough and large field of competitors all hungry to race. I was off the line well and held the front for a couple of minutes before settling back. Three guys (Bob Reuther, Eric Schlauch and Gerry Pflug) broke away to race for the win. Another group of 5 guys got away from me and soon I was riding alone. But here is where I saw how fit I was and how determined I can be. I continued to press forward, pushing myself and not giving in. The 5 ahead worked and rode hard together, but after several laps I reeled them back in: 5 against one and I still got them! I went immediately to the front of the group and attacked hard to push the pace, leading for the entire final lap. I opened up my sprint from a long way out on the uphill finish but was caught and passed by 2 guys at the line holding off the rest of them to take 6th place. I was completely spent after the finish. I found that race fitness, dug that last bit out of myself and used it all! It felt great to know that I was in shape and racing the best I could remember for this early in a season. The following weekend, September 17th and 18th, I was at Nittany Cross in Trexlertown, PA for the always fast, and always highly competitive MAC races. I was confident in my fitness and ready to race hard. Each day I rode strong and without major mistakes, but each day my positioning in the group was not ideal (I sat at the back of the lead pack) and I got separated from the lead group when someone ahead made a mistake. Still I fought hard and finished in 8th place both days. At first I WAS a bit disappointed in my result as I felt I could have done better if I positioned myself better and didn’t get separated from the group. But then I saw the times and realized I finished within 30 seconds to a minute of the winners AND I have not finished much better than 15th in these races in recent years. It was clear I was in great shape and looking at a strong season! I began racing cyclo-cross 12 years ago. It started a bit on a whim. I liked to compete. I enjoyed riding my bike. I wanted a new challenge. I read about cyclo-cross (yes, I never saw an event, nor knew anyone who did it) and it sounded fun. I hunted around local bike shops and found a cross bike and began my “training”. I then found a race and signed up. I still remember the event: It was sponsored by Guys Racing at None Such Farms and took place the day after it rained 5 inches and was a very muddy affair. I took 5th place. I was hooked. Twelve years later and I’m a different racer for a multitude of reasons. I grew from an inexperienced but tenacious rider who understood little about how to train, and who knew nothing about race tactics or bike handling into the cross racer I am today. I’m still tenacious (which is probably my greatest strength and biggest weakness too) but now understand how to train, and have learned to be a credible bike handler and tactical racer. I’m not the best in any of it (except maybe tenacity) but I at least make conscious decisions in all those areas and understand what others are doing better. I enjoy “rolling the dice” in races and taking chances that don’t always pay off which may not be great tactically but elevate my fun. When it comes to racing, my overarching goals are for my competitors to KNOW I was in the race and to challenge myself. Race season 2016 began in August, with preparation beginning months before. My training was on target this year as I followed what I learned over the years. As a result I was setting power number “records” for my endurance sessions in May. This was not a target of my training, just an outcome that I observed and was pleased to see. As I continued my build up I saw other improvements and changes over prior years: More terrific power numbers in my intervals and evidence of greater strength in endurance events. Probably the MOST surprising development this preseason was my weight. Without focusing on it, my weight was down to the level I don’t generally see until late in the racing season. This was all evidence that I was on target with my training. My body was on target to race but my brain was considering other options. This year I was presented with other opportunities that would draw me away from competitive cycling. My consulting work with Future Industrial Technologies(www.backsafe.com) was getting busier as they were offering me more contracts which required travel. My professional chiropractic practice (www.DrWahner.com) in Philadelphia was busy, plus I had signed my third contract with a corporation in the region to provide chiropractic services to their members. Add to this the most fun opportunity to come down the line: I signed on with current National Champion Jeremy Powers (www.jpows.com) and his Aspire Racing cyclo-cross team to be their Team Chiropractor. Could I do it all or more importantly SHOULD I do it all? Is it time to give up racing and focus on the professional side of my life? This was the decision I was pondering and of course it all comes at a point when I’m in probably the best fitness of my cyclo-cross career. What to do? This was the final event for the Pennsylvania Cyclo Cross Series and my performance here would determine the outcome for the series; would I take second in the series or fall to third place. Kelly Cline and I battled back and forth all season each besting the other multiple times and whoever beat the other today would grab second in the series and have bragging rights until next season! This rivalry served to push us to higher levels and forced us to be better racers. We were so closely matched that going into this last race 3 points (out of over 400 scored for each of us) separated us in our battle for second in the series. Both Kelly and I wanted that placing. Solstice Cross had a very deep and strong field with not only Kelly Cline lining up, but also Bob Reuther, Eric Schlauch, Blair Saunders, Marty Mrugal, Ray Zeimet and Gunnar Shogren. Several of those guys I have beaten only rarely. I was still in top fitness and feeling great AND I was still following my plan from the prior week: Hold nothing back and just go for it. With all that was on the line, this looked to be an interesting race. My start was solid and I was able to grab onto the leaders where we created a group of five including Bob, Eric, Blair and Gunnar. This group worked well together and we distanced ourselves from the rest of the field. I felt good and was riding with these guys who I had not often been able to stay with this season. Additionally, Kelly did not make the lead group and was behind chasing hard to catch on and try to beat me. After a couple laps it was the five of us together and I was feeling comfortable, but I was not satisfied just sitting on and letting the others dictate the race. Going into the third lap I made my attack and sprinted around my group and into the lead where I pressed the pace further hoping to break things up and maybe even get away. I was rolling the dice as it were, but this was my chance to go for it. I was able to push the pace and lead our group, but I did not break anybody off. A couple times some of the others tried to retake the lead but each time I accelerated to remain in front. After a lap and a half Bob and the others attacked around me but I had pushed a little too much and couldn’t hold them any longer. They got away and I was left riding solo. I pressed forward and maintained a solid tempo which prevented any chasers from getting closer for the remainder of the day. I ended up 5th place less than 30 seconds off the winner. Perhaps I should have just sat on the group and waited for the finish to sprint it out. I am glad I didn’t though; I committed to going all out and that is what I did. Kelly Cline fought hard this day too ending up in 6th place 24 seconds behind me. Once again the two of us were close together, but I did best him on this final day in the series to clinch second place overall. That is a result I am proud of and it matches my series placing from last year. Here I was at the LAST race of my season. This was my 23rd race this year which was by far the most I have raced in a season. It was a lot of races but I was still on top of my fitness (and in fact probably the best I have felt all year and even the best from the past several years) and I attribute that to being diligent in my training, getting rest, my diet and to my health routine of getting adjustments and chiropractic care consistently; all of which kept me healthy. Limestone Cross was the final race in the Mid Atlantic Series and was important for me because I was working hard to finish in the top 10 overall. That may not seem like a high placing, but in this series it is. Making the placing even more relevant for me was the fact that I missed one race in the series and in another I scored no points as a result of mechanical failure (Charm City Cross day 2) meaning that I was lacking valuable points. Incredibly for a mid December date it was warm and dry but this course was still not easy. There were multiple places to dismount (2 sets of stairs, one log step and boulders) plus two difficult hills and one tricky hill. The field of racers was terrific and held many guys who were tough competitors; it was to be a great race! I had a terrific start and was first through the initial turns and then settled in with the lead group. Up the difficult hill I easily stayed with the leaders but the group was getting strung out. As we progressed through the first lap the leading group of 10 guys got away from me and I was gobbled up by Mark Featherman, Kelly Cline, Ray Zeimet and Blair Saunders. At times they were better than me and pulled away, but then we would hit one of the hills and I would pull them back and move to the front. One of the most fun sections for me were the tough hills that I was able to power up where others were struggling and having to dismount. This became the deciding factor as each time we hit the hills our group moved forward and eventually pulled some of the leaders back while also breaking other guys off the back. Into the final lap it was down to Blair and me surging back and forth past each other and Ray coming up quickly to us after recovering from a flat tire. As we hit the final tricky little hill Blair, who was in front, bogged down forcing me to a stop and causing Ray to crash into me from behind. The only damage done was our little group was split up as Blair was able to get back going more quickly and I was left chasing with very little time to make up the distance. I finished 7/10 of a second behind Blair for a 7th place finish on the day. This was a fun and tough race. Again I was going for it attempting to get the best result for myself. I was pleased with my race and my effort as I didn’t hold back and I really didn’t make any mistakes. It feels terrific to finish the season on top of my fitness with a very good result. In fact, my placing today moved me into 8th place for the Mid Atlantic Series so I reached that goal too. Now I move into my off season where I will return to riding my bike, doing some running and strength training, but keeping it fun and simple. I can release the regimentation of interval training and can relax a bit on the diet; just in time to enjoy the delicious foods of the Holidays! Incredibly, I already miss the racing and hard training and I am looking forward to next season. Yes it has been a month since the season ended AND longer than that since my last blog. It was busy and I got distracted with other priorities and besides that, winning a state championship was the pinnacle of the season so it could be anticlimactic to write about the remaining races. But that is not how it wound up. At the Pennsylvania State Championship race on November 22rd I was in great form but as it turned out I was still on the way up! I did not race the following weekend as it was Thanksgiving week and thus time for me to eat, relax with family and friends and enjoy a weekend off from racing. I continued to ride and put in a block of training to hone my fitness for what would be the final two weekends of racing for me. The final 4 races included 3 Pennsylvania Series races where I was battling Kelly Cline for 2nd place in the series and one more Mid Atlantic Series race where I was fighting to move into the top 10 providing goals for me to aim towards. 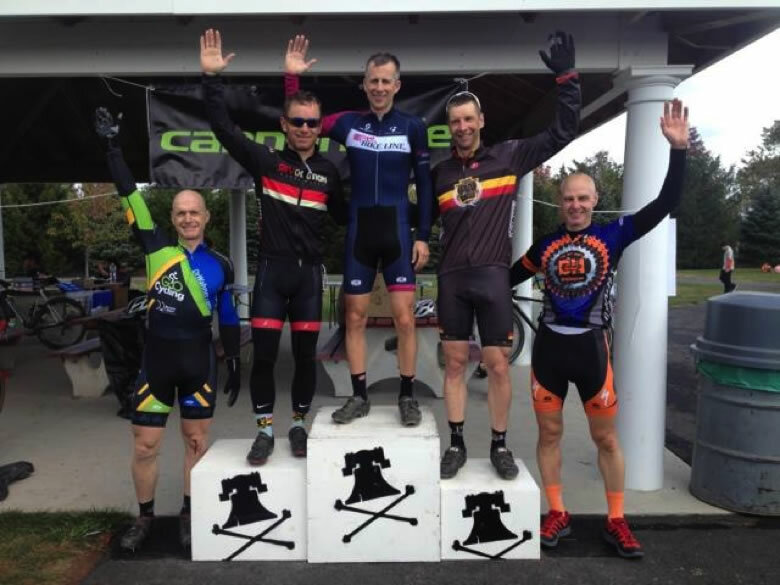 December 5th and 6th were two PACX series races with the first at Rivertown Cross and the following day at West Chester Cross. Both days had strong fields of athletes who were eager for racing since many had taken one or two weekends off. My direct battle was with Kelly Cline who had jumped past me in the standings to take over second place while Bob Reuther had a commanding overall lead. Frankly though I had a different mindset for my racing: I had attained my dream goal of the state championship title so I decided it was time to throw caution away and just go for it in each race. There was no reason to hold back and ride cautious to try to protect a placing in a series. It was time to go for a great result against my toughest competition; to try to beat guys I haven’t beaten. At Rivertown we had a course that challenged my bike handling skills as it was slippery and a little muddy. Off the start Kelly Cline jumped away immediately with Bob Reuther behind followed by Joe Bothell and then me. Kelly got a good gap and was bolting away with Bob in pursuit. Kelly looked impressive and had me thinking that if he was in that good a condition I wouldn’t be seeing much more of him. I remained calm and pushed forward eventually reeling both Bob and Kelly in while pulling a few guys along with me. As we started our second lap I attacked at the same time Bob attacked which drew Kelly forward too giving the three of us a gap over the chasers. The three of us pushed a hard pace eventually establishing ourselves with an insurmountable lead. From here Bob and I fought back and forth, attacking, which unhinged Kelly from our trio. I held the lead for a couple of laps pushing the pace hoping to drop Bob (who had consistently beaten me over the past several seasons – but this was my time to NOT hold back, to go for broke and see what would happen). As we went into the final lap I knew Bob was going to attack me so he could avoid trying to out-sprint me in the end. He attacked early and got a gap, I tried to fight back but he was perfectly smooth through the technical turns and I couldn’t make up the time in the power sections. Bob came across the line with the win with me a few seconds back and Kelly holding on for third. This was a fun day. I went for it and came close to my goal of besting Bob and all the others. I held nothing back. At the end of the day, Bob had an insurmountable lead in the Pennsylvania Series and Kelly still held a lead over me for second in the series. Next up West Chester Cross. West Chester brought something unusual this time: Warm, nice weather! It is almost always cold and windy for these races. Now it started off bitter cold overnight and first thing in the morning the ground was froze solid, but as the sun came up the temperature rose quickly. While it sounds nice to race in warm weather, this actually worked against us because the melting surface brought all the moisture up and made for slick, greasy turns. This day I held to my plan of “holding nothing back”. Today’s field included my toughest competitor Kelly Cline, but also two guys I haven’t beaten recently in Bob Reuther and Joe Piccillo along with persistently tough competitors Ray Zeimet, Marty Mrugal and Mark Featherman. It didn’t matter; I was going to ride without restraint. I came off the start line in first and held that position for a couple minutes before Bob and Joe came around me. I jumped onto their wheels and stayed there throughout the opening lap. At the run up just before the end of the lap the three of us were bunched together with a good gap to the chasers; we had established the winning break already. Into the second lap the three of us charged through the slick turns each pushing the limits. We stayed together for another half lap until Joe Piccillo made an aggressive attack I couldn’t answer. Joe and Bob were away and I was fighting alone in 3rd place. I kept going hard trying to catch onto Joe and Bob but they increased their gap and I realized I was now fighting for third place. Not far back was a strong group including Kelly, Ray, Marty, Mark and a few others. They were working hard and I knew I was the carrot they were in pursuit of. Everything was going well as I kept them at bay over the next couple laps and their group began to splinter. Into the last lap I was holding onto third but Ray and Marty were charging forward desperately trying to catch me. A half lap to go and I was in control…until I wasn’t! I slid out on a simple turn allowing Ray and Marty to get closer as they saw my mistake. Then just a minute later I slid out again allowing my lead to evaporate and providing Ray and Marty with extra motivation. They were definitely going to catch me; I just had to decide how to play out my hand. It was going to come down to a sprint and I wanted to set it up so I came onto the finish straight with the lead. I pushed steady, but not all out so I could “rest” a little for the sprint but hard enough to keep them behind me going into the run up. I wanted to be first up the hill and back on my bike. As we dismounted for the run up we were all together with Marty on my right and Ray on my left. Then as we leapt the first barrier I felt a hard tugging on my helmet pulling me backwards and down; it took a second until I realized Ray had accidently hooked my helmet with his handlebars as we each fought for position. I yelled to him what was happening as he realized it too and fortunately he was able to disengage his bike from my head! I got to the top first, was on my bike instantly and opened up my sprint right away allowing me to hold onto third place! What an exciting and unpredictable finish! It was a truly fun day to race! After West Chester I squeezed my way back into second place in the series besting Kelly by 3 points. There was one more race to go, Solstice Cross, and it would decide who would take second in the series. Better yet for me, I was racing at my best level this entire season and feeling more fit and strong then I can remember. It is that time of year: Championship season with the states in the region holding their championships in the weekends around Thanksgiving. Pennsylvania placed theirs on the Sunday before the holiday out in the Pittsburgh area. I don’t get out that way to race much as we have such great events on the eastern side of the state. They do have some terrific athletes out that way including reigning national champion Craig Cozza, the dominant Gerry Pflug and the very strong Gunnar Shogren among others which makes for some good competition. The question was: Should I make the trip out there to race? Many others from this region had the same question. For some the answer was made based on having to drive over 5 hours each way and stay overnight. Others could not take a full weekend away from family. A few wouldn’t go because of injury or poor health. For some the decision was based on if they felt they had a chance to win a state title. Unfortunately a large number decided to forgo the trip and take a weekend off racing. I decided to make the trip with the mantra “you gotta be in it to win it”. I was not a favorite to win the title but I was not a long shot either. As the season progressed I have gained ground on the top guys culminating last weekend with my second place at Kutztown where I pushed Gerry Pflug for a good bit of the race. I wasn’t sure who else was going but didn’t care either; my fitness was very good as I aimed my training to be hitting a peak at this time of the year. I figured with some smart racing and a little luck I might be able to grab the title. The morning of the race saw temperatures around the freezing mark with overcast skies but fortunately (or unfortunately depending on perspective) there was NOT the predicted snow fall. I rode the course a couple laps to preview it and was impressed. It had great elements including: Punchy hills, off camber sections, a little gravel, wide lanes, a nice finish straight and a tough sand pit. The only problem was the course was short which meant more laps and possibly more lapped riders who could affect the tactics. At the race I also learned that a couple guys I expected to make the trip west to race decided at the last minute not to come. I also found that the guy I anticipated battling for the title was skipping our race to race in a different field that day. He told me that he was feeling worn down and figured it was from all the travel he’d been doing driving most weekends from western PA to the east for races. Suddenly I was the favorite to win the state title. My race had a combination of two age groups in it – 45 to 49 and 50 to 54 – so I would be racing with Cozza and Shogren but they were in the 50 to 54 bracket while I was competing for the 45 to 49 title. As those two are incredible athletes and the Pittsburgh area is their home territory, my goal was to stay with them as long as possible. Off the start I took the hole shot and carried it until just before the sand pit where I let Cozza take over leadership duties. From here I followed as Cozza powered through the off cambers, the climbs and twists and turns until late in the opening lap Shogren jumped around me and attacked with he and Cozza quickly creating a gap. I tried to regain contact but those two worked hard and showed why they are national caliber champions. Behind me I had created some space from my pursuers including David Lowe and Frankie Ross but they refused to concede and rode strong to catch me. For three laps it remained Cozza and Shogren in the lead with about 15 seconds to me and then about 10 seconds back was Ross and Lowe, until Cozza flatted a tire and had to exchange bikes in the pit. Suddenly I was very close to Cozza again but Shogren was getting away. I fought to keep Cozza close and did so for a couple of laps but I was running up to my limits; up the power climbs and through the sand I began to feel my thighs burning and my strength waning. The good news was that Frankie Ross was falling back from me so I was riding alone in 3rd place overall but leading in my age group. And that is how it remained as we completed 8 laps in the race: Gunnar Shogren for the win, Cozza in second place and me coming across in third overall but #1 in my age group for the Pennsylvania state title! Other notes: This was a terrific weekend for the Wahner boys as Paul also won the Pennsylvania State Title in the 55 to 59 age group. He worked diligently all year and raced very consistently all season going to Pittsburgh as one of the favorites. In his race he rode away from the rest of his field winning his event and his age group. He is a well deserving champion! This was my second state title in the 45+ age bracket as I won the title 5 years ago in my first year in the group. That was a dream come true at the time and I honestly didn’t know if I would ever repeat it. It seems incredible to me that I would take my second title in my final year in this age group. In a race as in life there are leaders and followers; commonly we fulfill either roll at different points in an event or in different races. The questions are asked: Is it better to be a leader or the follower? Which is more honorable? Which is more successful? Over the weekend of November 14-15 we raced Kutztown Cross both days with Saturday being a Mid Atlantic Cross (MAC) series race and Sunday being the Pennsylvania Cross (PACX) series race. In each series I am performing solidly overall with relatively consistent performances and results equating to a top 10 placing in the MAC and top 3 in the PACX thus far. There have been no “standout” results but have been many races where I feel I made an impact on the racing. Several times I had an opportunity for that great result but squandered it with a mistake. Kutztown cross felt like the weekend I could change that. I came into the weekend with a lighter training load in my legs so felt very good and ready to race hard. On Saturday we had a strong field of racers with 9 out of the top 10 in the series present and most of the top 20. It was also a windy day on a very open course so I knew it would break up into groups and that it would be imperative to stay in a group. I started off strong and was in the leading group of 10 but toward the back of the line when Kelly Cline and David Kahl let a gap open up. Knowing this was a big problem I quickly jumped around the slowing riders and tried to bridge up to the leading group of 6. I was a handful of seconds back and charging hard when we made a turn onto the start/finish straight and into the wind. I pushed hard alone against the wind but could not close the gap as the 6 ahead worked together and had more protection from the strong wind gusts. I continued on alone driving hard to catch the leaders with a big group behind driving to catch me. I lost some ground to the leaders and after a couple laps it was obvious I couldn’t catch them alone. Behind it was down to two guys chasing me: The strong Matt Seaton and the resurgent Kelly Cline. They were closing in on me so I decided it would be better to work in a group of three to chase the leaders than to continue alone. When they caught on to me I let Matt take the lead while I took some respite from fighting the wind. From that point Matt and I took turns pressing the pace and driving forward while Kelly dangled on the back, following our pace but never going to the front. I could tell he was struggling a bit and kept trying to break him off but each time we accelerated, Kelly would claw back on to follow. Down to the last lap it was the three of us fighting for 7th place. I felt I was the strongest in the group and planned where I would make a couple digs and where I would lay down my finish sprint. All was going smoothly until with a half lap to go I slid out in a tight corner lined with acorns. That’s all it took for Kelly and Matt to get away quickly gaining 10 seconds on me as they attacked when they saw me down. Matt pressed the pace as Kelly followed and I tried desperately to catch up but to no avail. Kelly out sprinted Matt for 7th and I trailed in for 9th. On this day Matt and I lead our little group around each hoping to beat the others, but it was Kelly who was able to follow and come out ahead in the end. In this case the “follower” was in the better position, protected from the wind and thus more successful in the end by being rested and able to out sprint the group. On Sunday we lined up with a smaller field and fewer of the top guys but still a solid group fighting for the podium placing in the PACX series race. It was less windy but we were at the same wide open course in Kutztown so the wind could still play a roll. After my disappointment and frustrations of yesterday (first missing the leading group and second sliding out in the closing minutes of the race to lose my position) I was focused and intent today. I was NOT going to miss the leading group and I was NOT going to make the mistake of letting a cagey rider like Kelly follow me all day. I had a smooth start and was in the lead as we entered the first turns. I eased up to let Bob Reuther come past then accelerated to grab his wheel and slot into second. As we came over the first set of barriers Bob was slow to remount so I jumped past and back into the lead, setting the pace for the others. I felt GOOD. I accelerated out of corners and pressed the pace staying in the lead. When I heard someone slide out behind me in a turn (turns out it was Bob) I pressed the pace a little more knowing the others would have to work that extra little bit to catch back on. I lead for most of the first lap until Gerry Pflug came past and I latched onto his wheel, following for a while as we gapped the others behind. It was fun to be in the lead and to see all the others chasing. Halfway through the second lap it was Gerry and I with a clear lead of a handful of seconds on two pursuers, Joe Bothell and Kelly Cline with several others just a little further back. Gerry moved aside to have me come around and as I passed he told me that we should work together to distance the others. No question it was the move I wanted to make as I didn’t want Kelly or Joe latching on as either would be dangerous in the finale. I took over and pressed the pace some more as I still felt relaxed and strong. We began to steal more time from our chasers; things were looking good! This is where I made a tactical error: I enjoyed being in the lead, dictating the pace. I imagined Gerry was hurting and that perhaps with a little more effort I could get away from him too. It didn’t matter that we still had over three laps left. I continued to lead and push a little deeper, Gerry following. I stayed in front too long so that when Gerry came around to take over the pace, I couldn’t hold onto his wheel and he slipped away. First it was a few seconds but with his smooth technique and strength he extended his lead. I pushed forward keeping up the pressure, hoping he might make a mistake or tire out that little bit I needed, but to no avail, Gerry stayed away for the win. I also stayed solid and actually further distanced Kelly and Joe to finish with my best result in 2nd! Kelly and Joe had a battle with each attacking the other multiple times before Kelly got the better of Joe and got away for 3rd place. This was a stellar day for me. I was the leader for a while. I was a follower for some time too. And eventually I was alone. So which is it better to be? Personally it is fun to be the leader and I love that position. Which is more successful? Both can win IF they play their cards right. Which is more honorable? I don’t think there is an answer to that. Only the person racing can know if they raced with honor and dignity. To the spectator and even to the close competitor it can be impossible to know what is going on in that athlete’s mind and body, which is where the answer lies. It has been a great season thus far with 16 races completed already; a number that in past seasons would have been my total for the full year. The weekend of November 7th and 8th we raced at Fairhill Park in Maryland and at the Sly Fox Brewery in Pennsylvania; two great events for different reasons. The Fairhill park venue is probably the BEST venue for cyclocross in the area. I’ve said in past years and it still holds now: A world class cyclocross race could be held there. As for the Sly Fox course; it is probably the best course for spectators and excitement. They created an event with boundless energy and fun for the racers and the fans. I had a solid weekend of racing with stints in the lead each day as I got off the line perfectly and was able to hover around the leaders for a while each day. Both days I was eventually dispatched from the lead groups and I ended up riding alone finishing 6th in Fairhill at the 8th event in the Mid Atlantic Series (my highest placing in the series this year and enough to push me to 10th overall in the series) and coming in 4th at Sly Fox at the 9th event in the Pennsylvania series (where I am 3rd overall in the series). I also had technically good rides where I made no major blunders, had no crashes or mechanical issues. Overall it was a good weekend. I have the honor of racing with some of the “Greats of Cyclocross” in our region. Week in and week out I line up next to Kelly Cline, Marc Vettori, Greg Ferguson, Bob Reuther and other notables such as Kris Auer and current national champion Craig Cozza. Throw in the local favorites like Mark Featherman and David Lowe who everyone seems to know and there is a lot of “celebrity” in my races. With all the fans those other guys have there is a lot of cheering and noise encouraging them, pushing them to go faster and to beat that other guy. That other guy is often me! It truly is incredible how many people are out cheering for those guys! Lap after lap, all around the course fans scream for them as they come near. They each earned those fans and cheers over many years by being leaders on and off the course. All of them worked behind the scenes to promote races, organize race series and teach new riders in the sport to become racers. Heck most of those guys taught ME how to race and still mentor me even though we are direct competitors! During the races throughout the years those are also the guys who perform with class and style and who also frequent the podium. It’s obvious why they are so popular. So back to my “whining and crying”; this entire season I have found myself in the company of one or more of those guys every race and hear the cheering and encouragement they get. I have not earned their level recognition and often pass by without note. Now I don’t race to get fans or become popular, but being cheered for really does make a difference in propelling you forward. At those points when you are digging deep and clawing to hang on, a cheer can help you eke out that last little bit of effort. This past weekend I amped up my efforts to find people to cheer for me. During Saturday’s Fairhill race the cheers for Kelly were innumerable as I chased after him. After the race I was asked by another cyclocross “Great”, Anne Rock, how it went. I related that the race went well but I had “tears in my eyes” because everybody cheers for Kelly and not for me. I did my best little kid whining and complaining. Anne Rock took the challenge and promised/threatened to change that the next day at Sly Fox. At Sly Fox Cross I continued my “whining” to guys like Marc Vettori and a couple others during warm ups. I knew I was unleashing some “trouble” and I was looking forward to seeing what form it took. During the race I actually had people cheering for me! I loved it! I also was the recipient of some of the best, most creative and actually encouraging heckling I ever heard! Lap after lap as I came anywhere near the bike pit I heard cheers and jeers emanating from the pit. I wasn’t sure who it was until the very end when Vettori jumped out cheering wildly and baring his chest at me. I couldn’t help but laugh! The guy was unbelievable! Thank you Anne Rock, Marc Vettori, and all the others out there that took on the challenge to cheer for me and heckle me at Sly Fox. It truly is appreciated and made the day great fun! The weekend of October 31 through November 1, 2015 brought two fun and different races with Swashbuckler Cross on Saturday followed by Stoudt’s Cross on Sunday. Going into the weekend I felt ready; my training was solid, I was healthy and I felt good. Saturday morning was cold with temperatures in the mid-thirties on the drive out to the Pennsylvania Renaissance Faire where Swashbuckler was held. The sun came out as the morning got going and really warmed things up. I got off to a solid start and held a position in the front 5 or 6 when one guy took a turn across gravel too aggressively and slid out; I had a clear line around him on the inside but his crash held up some other guys allowing a group to establish at the front just a couple minutes into the race. Soon it was down to just 5 of us in front: Bob Reuther, Kelly Cline, Joe Bothell, Mike Stevens and me. Bob, Joe and Mike are all Bike Line teammates leaving Kelly and I outnumbered if they started to use team tactics against us so I moved myself into 3rd behind Bob and Kelly and made sure to stay there. As we progressed the three of us were able to drop Mike and Joe but soon I was dangling off the leaders too; Bob and Kelly were riding smooth and strong while I made a few small errors. Each error (like taking a poor line through the muddy “whoops”) let them gain some seconds on me. I fought back multiple times but it became clear they were going better than I and would continue to leave me so I made the decision to focus on riding smooth and steady the rest of the way and save some energy for the next day’s race. I finished in third place about 30 seconds back with Joe further back and Mike battling Marty Mrugal to the line to take 5th. This was a good solid day of racing for me. I felt strong and healthy and didn’t bury myself digging too deep. I was looking forward to racing Sunday at Stoudt’s where the course could be harder and the field of racers was definitely stronger. Everything pointed to me having a very good race there. At Stoudt’s on Sunday I felt good warming up: Relaxed, not sore, good power in the legs. 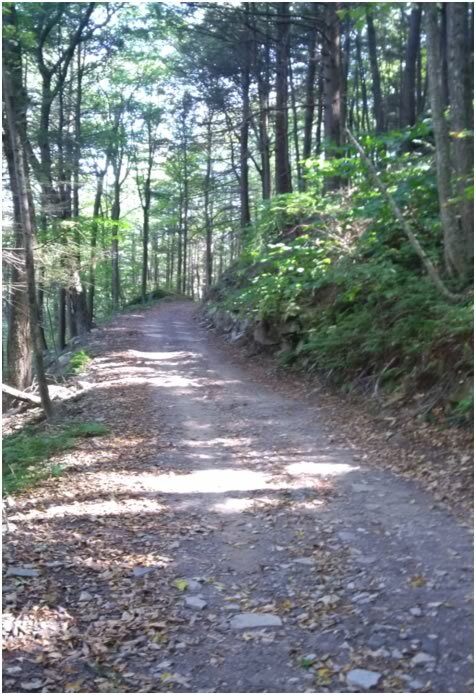 The course had elements that favored my strengths, especially the power climb up “goat hill”. It also had elements that would separate the racers pretty quickly including innumerable turns and a long tight section through the woods where passing was nearly impossible. I was off to a good start sitting in the lead group and feeling comfortable when we hit the first climb up goat hill. I powered my way up the hill and past a couple other riders and parked myself in second place behind Joe Piccillo. Into the second lap Bob Reuther came around me and after about another lap Blair Saunders came past too. I was not able to hold onto those guys and they gapped me but I was solidly in 4th with Kelly Cline a little back and then Mark Featherman, Marty Mrugal and several others chasing from further behind. I felt good and worked to stay away from those guys; things were going along smoothly when in the woods section I hit something with my rear wheel. I thought I may have caused a flat but as I rode it seemed okay (but then again I was riding in muddy, boggy trails and grass) so I rode past the pit without trading bikes. When I hit the short road section I realized I made a mistake: My tire was losing pressure and I was losing speed. I drug my low pressure wheel up and down the hills and through the turns to get back to the pit but by the time I made the exchange Kelly, Mark and Marty had all passed by, and Greg Ferguson and Dave Lowe had also caught me. All that work and I lost so much so quickly! I rode my pit bike for a lap while my brother Paul and Kevin Saint Clair changed the rear wheel on my race bike and prepped it for me. I was happy to change back onto it and hoped to ride it back up to Kelly and fight again for a podium placing. Right away though I had a new problem: The shifting was out of sync on the new wheel and would not cleanly hold a gear! As my gears skipped and crunched I lost more ground to the guys ahead. I was dejected and frustrated! At this point Dave Lowe and Greg came past me while I tried to find some solid gears and hang on. While I didn’t want to lose those places, it was terrific to follow two superior bike handlers like those guys. Dave was floating so smoothly through the twists and turns that I was in awe. I figured I was going to have my hands full fighting those two for placings when suddenly bad luck descended on Dave: He flatted his tire in the same area I did! From here out Greg and I traded pulls back and forth with each of us riding some sections better than the other. In the final lap I got the best of Greg on goat hill and was able to stay away to finish a disappointing 7th. I had such expectations for today and in the first half of the race things were looking good until “cross capriciousness” befell me and quickly changed my fortunes. Who are the “REAL” crossers? I had a conversation this weekend with another racer as we previewed a course that made me think. He said something I have heard many times before: “This is the time of year when only the ‘real’ cross racers come out.” Now, it’s true that we are getting to the part of the season when the weather worsens and fewer athletes turn out to race, but does that make those of us that do come out “real” cross racers? It seems kind of arrogant to believe that just because I race deep into the season and in sometimes nasty weather, that it entitles me (or anyone else) to be the “real” cross guys. I enjoy racing all the guys that come out, whether that be for a race or two early in the season, a few races here or there or every weekend. Yes, it takes extra commitment to get up early on a nasty, cold rainy morning and go out racing through mud and muck. It is fun to believe that makes me special (maybe it just shows I’m crazy) but really it’s just racing. If you come out to race cyclocross you are a “real” crosser! Maybe it is just for the one day, but in my book, “Welcome! It is terrific to have you here!” Now let’s get it on and see who the best cross racer is today! Click to see latest photo - bikers in the mud! Okay, so I promised myself I would keep up more with writing for the blog. The racing has been interesting and very good this past weekend. We had Whirlybird Cross on October 24th at Bryn Athyn College and I have to say the Guys Cycling Team did a terrific job putting together a course through farm lands. Although there were not many features or elevation changes to work with, the course was challenging. They put together a course that allowed racers to go toe to toe the entire way. After previewing the course I decided a patient approach would be the way to go and so I started off more easily than usual. As the group hit the first turn at high speed, some of the racers “forgot” to turn and forced most of the field to the right into the tape and poles. I was immediately behind this and we were pushed right too, but luckily I had two highly skilled riders sandwiching me (Ray Zeimet and Ed Hein both from Guys Cycling Team) and the three of us were locked in shoulder to shoulder to shoulder and able to, as a unit, navigate the turn and stay out of trouble. If any one of us panicked or made a mistake, we would have taken ourselves out and most people around us! As the race progressed I moved up into a big group and often drove it forward as we caught more riders dropping off the lead group. I kept punching it forward driving the pace, but trying to not go so deep that I would blow up. Bob Reuther was also in our group and also taking turns working hard to move us up to the leaders. Unfortunately we got little help from the others in our group and eventually it ended up as a group of 6 chasing two pairs of riders ahead. In the final lap I found myself at the back of the group and knew I was in the wrong place to have a chance in the final sprint. I worked forward a couple spots and then coming out of a technical spiral the guy in second slid out allowing Reuther to get away but also allowing me to move up right behind Monte Frank with David Kahl right behind me. As we came to the final turn I was gearing it up to prepare to sprint for 6th place, but I took the final turn too aggressively and slid out causing Kahl to crash on top of me. I was up pretty quickly but lost two more spots and ended up 9th. This was my best result in the Mid Atlantic Series in over a year, but could have been much better. Regardless, I was happy with my race and fitness as I was VERY active the entire way. The following day brought us to Crossasaurus Awesome. This race always has a fun vibe around it and although it is a very flat course, they do a lot to make it a good race. I had a great start as I got the hole shot and led it through the opening turns. I sensed trouble though as I slid through one early turn but resumed racing. I was holding second place when I slid out onto my side in a tricky turn and lost some places and some distance. I followed this up a couple minutes later with another slide out onto my side and more places lost. A half lap in and three mistakes! NOT GOOD. I got it back together after that and worked my way forward from that point on. About halfway through the race I was alone in fifth just a handful of seconds off the leading 4. At this point Reuther got away in the lead alone, Kelly Cline and Marty Mrugal were together, and Gerry Pflug had dropped back to me because of a flat tire and low tire pressure in his spare bike. I chased after Kelly and Marty and was just behind them when I hit something hard with my rear wheel and immediately flatted the tire. I had to ride several minutes with a complete flat to get to the pit for my spare bike. This allowed Pflug to catch me with a couple others coming fast. Fortunately I got my spare bike and was able to ride it strong the rest of the way and hold onto 4th. The disappointment was I felt I had good form and it was possible to catch the two ahead and fight it out for 2nd place. Sometimes bad luck happens though. 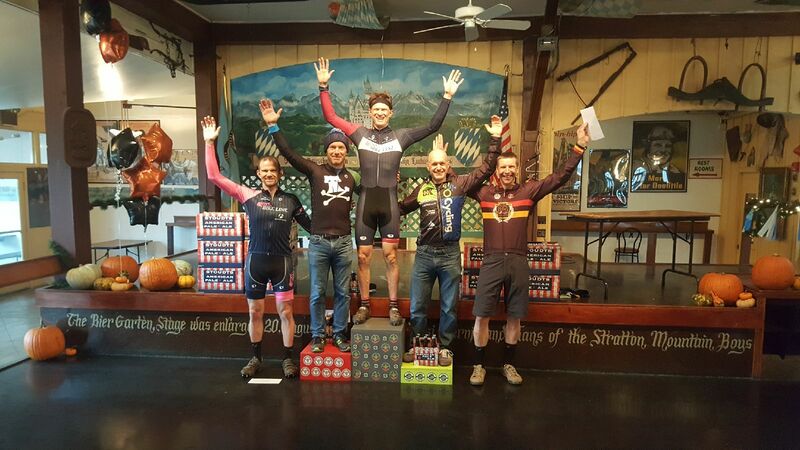 Crossasaurus Podium 2015: Barry Wahner 4th, Kelly “Mr. Podium” Cline 2nd, Bob Reuther 1st, Marty Mrugal 3rd, Gerry Pflug 5th. The question comes up regularly, sometimes asked directly, other times implied: Why do you race your bike? There are many answers and all of them true: I like the competition. It provides an outlet for my competitive side. It compels me to stay healthy. It is fun. Because I can. But when I truly consider the question, the answer is: I race because it is a way to test myself, to push my limits and learn how to be better, to push myself harder to get the most out of life. Racing helps me to learn more about myself. This is where I learn something about myself: When confronted with a challenge what will I do? When I am hurting and tired, heart rate spiked and out of breath, what choice will I make? In these moments it is more instinctual, more about what is deep inside. After a race you can dissect what happened, look at the choices you made and see how that turned out. From this review you can set new goals for the next race. But IN the race, IN that moment, is when you learn what you are really committed to. In the race you not only exercise your body but also your commitment to the goals you set, your dedication to the plan you made and your ability to make a decision in the heat of THAT moment. It may seem silly or to have no bearing on real life, but I see racing as a way to “exercise my commitment muscles”; to train myself to be the best I can be; to learn to be more effective at pushing through difficult periods; to practice getting back up after falling or experiencing disappointments. Racing forces me to practice making decisions under pressure and to learn to take risks. And it lets me do all this in a safe environment; one where if I do fail, or the decision was ill conceived, I only end up racing to a poor result. Nothing more dire will come from it. My decision at Quaker City Cross: d) Fight again and accept the risk. I focused on that decision and slowly fought forward catching Miesemer and Cline and dropping them. Continuing to fight and clawing back Mrugal and battling him through the waning minutes of the race to just hold him off and take fourth in the race. It was good practice for life: demonstrating that not giving up, taking risks and pushing my limits will move me forward. So why do I race? To continue to learn, grow and better myself. To keep practiced at making and keeping commitments, setting goals and overcoming adversity. I race because it helps me to be a better me! Yes, we are deep into the racing season and I’ve yet to post a blog to share what has been happening. I have reasons why, and some are good while others are just excuses. If you have been disappointed that I have not posted, I apologize but I also thank you for being interested in the racing. Frankly this blog serves two purposes: To inform any interested people on how the racing is going AND to act as a diary for me to recall how my seasons have gone. I have considered writing many times in the past 7 weeks of racing but just haven’t sat down to do it. I have also been following other blogs written by guys I race against and find they do a terrific job relating their views on the racing and wondered if I had anything better to say. (Three of the most interesting cyclocross blogs are written by Mark Featherman at Feathermanblog.blogspot.com, Marc Vettori at FatMarc.blogspot.com and David Lowe at cyclocrossracer.blogspot.com). I will provide an overview of the racing thus far: As of October 18th I have raced 10 times in 2015. I am satisfied with my efforts and feel my results accurately reflect my fitness, my skills and preparation for the season. I also feel that I am improving and can score better results in the coming weeks. Over these 10 races I have had ups and downs, good luck, bad luck and fun. I can’t say I have had a bad time racing. Overall my results seem to be a little off from previous years; could be due to getting a year older but I’m not owning that excuse. In many ways I am a better, more skilled and stronger rider than I have ever been. Knowing that, I am confident my results will improve and I will end the season with the level of success I’ve enjoyed in recent years. This season has brought terrific battles in each race, none better than what Kelly Cline and I continue to fight each weekend. He and I are going nose to nose, and toe to toe in each race. It has been fun and thus far we are about 50/50. He is an honorable competitor who will share a tip and give advice on tactics before a race; never holding back even though he knows I may use that information to beat him. I’ve also been battling Mark Featherman, trying to get the best of him, but thus far he has beaten me about 2 to 1. It is not over yet, Mark! In recent weeks Trevor Williams and I have had quite the rivalry. I have nosed him out a few times in past races to come out on top but he is proving relentless and very tough. It is guys like these (plus others) that keep me sharp and focused on my fitness, diet and training. If I want to win these battles there can be no slacking! Several times this season I jumped off the line for a terrific start and got the “hole shot” (first guy into the initial turns) which is always fun but doesn’t necessarily pay off with a great finish (especially if you go too hard and slow down to recover). A couple times I had poor starts and dropped far back among the racers and had to fight forward for the remainder of the race. This can also be fun as you constantly focus on the next guy ahead to battle past them. Sometimes I’ve had better finishes on these days. There have been a couple of mishaps this year too. At Cooper River Cross I was with the lead group in the opening lap when I slid my front wheel out in a fast turn and went over the handlebars with my bike flying behind me. I landed in the weeds with my bike landing on top of me! I was up quickly but had to stop because I broke a spoke in my rear wheel and I had to tie it up so it didn’t tangle in my derailleur. After all this I was far back in the field and spent the day fighting forward for spots. In day 2 of Charm City Cross I was riding well and battling a strong group of racers (Kelly Cline, Greg Ferguson, Kris Auer, Carl Reglar and a couple others) with just over one lap to go when my crank arm unscrewed from my bike! I don’t know how it happened; suddenly I only had one pedal on my bike! I ran with my bike for a couple of minutes with the plan to exchange bikes in the pit but after I crossed the start finish with one lap to go, I realized I was more than a mile from the pit and that by the time I got there the race would be over. I did something I NEVER did before and stepped off the course. I wanted to finish but there was no point; already most of the other racers had gone by and surely the rest would soon pass me before I could get my spare bike. I thought the race would give me a DNF (did not finish), but because I had gone through the start/finish point I was awarded a finish placing but one lap down. 10 races in and going strong! I’m having fun, pushing my limits and looking forward to 10 more races. I promise to post again much sooner next time. wahnerchiro@snip.net © 2011 Barry Wahner and Zipin Web & Consulting. All rights reserved.